When a conversation is running smoothly, you know exactly when to nod, hum, or when to start your turn. You feel understood and connected, and you sense that your conversational partner feels the same. However, a conversation may also contain awkward silences, simultaneous starts, and an overall feeling of stuttering and stammering. During such conversations, you are often left with feelings of distance and mutual incomprehension. Many people share the intuition that the expression of ‘being in sync’ with someone means that you are somehow in tune, in agreement, or in harmony with the other. 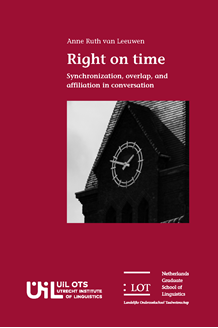 This dissertation explores whether this intuition is correct; it investigates whether specific temporal patterns between turn-taking speakers, including synchronization of speech rhythms, shape the affective impression of speakers in conversation. The answer to this question can broaden our understanding of the affective push-and-pull of spoken interaction that we experience every day. This question was explored by presenting participants with short fragments of dialogues between speakers in which we manipulated the temporal patterns between those speakers. Participants were then asked to rate the perceived degree of affiliation between the speakers of those fragments. In the last study of this dissertation we also recorded participants' real-time affective response during listening to these fragments. We found that, in addition to the presence of overlapping talk, responding too early given the beat of the previous speaker conveys disaffiliation. ‘Being in sync’ is not just a figure of speech, but a real sign of affiliation in spoken dialogue.